"Before anything else, preparation is the key to success." This a sample quiz. 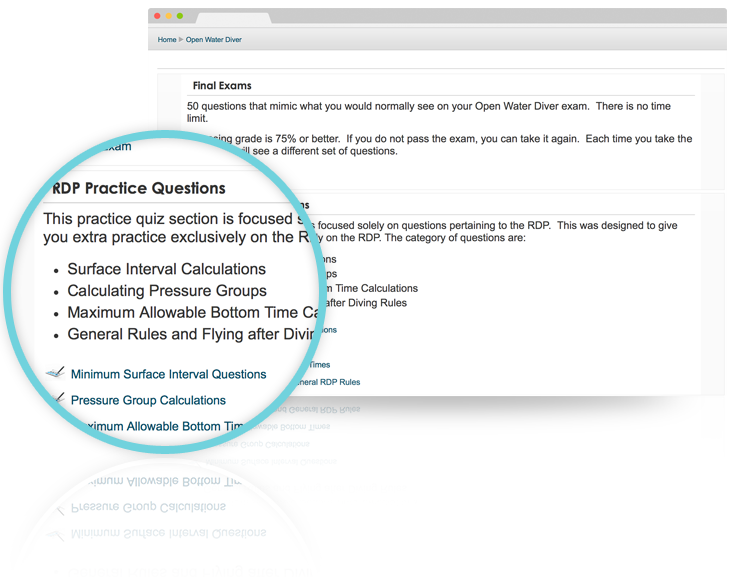 The actual practice exams are 50 questions each, just like you will see on your final exam. All questions on our exams are based on the same type of questions you will see when you take the actual final. You do a dive to 23 meters/74 feet for 27 minutes. After a 52 minute surface interval, you want to do another dive to 14 meters/46 feet. 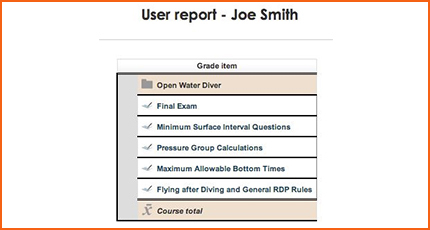 What is the maximum allowable time for the second dive? Let’s say that the air in your tank lasts 60 minutes at the surface. If you were to descend to 20 meters/65 feet, how long would your air last if your were breathing normally? Number 1 in the diagram listed below shows which part of the regulator? If you took a glass filled with air and you took it down to 20 meters/65 feet, the volume of the air inside the glass would be reduced by 2 times, or it would be 1/2 the volume as it was on the surface. What is the altitude above which the dive tables should not be used unless special procedures are followed. When diving, if your regulator begins to free flow, what should you do? The following signal illustrates what? When ____________ forms in the bloodstream and tissues it can cause DCS. More than 20 final exams to practice with. Our exams are modeled after the final you will take. We can’t give you the answers to the tests, but we can help better prepare you for the actual final exam. 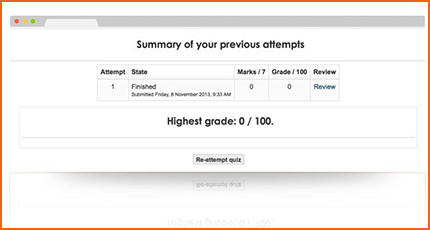 You have the option to review your exam attempts from our report window. After you take an exam, all questions can be reviewed at the end. You also have access to all the exams you have taken in the past. This is a nice guide to help you review missed questions. Need help with just the RDP type questions? No problem. 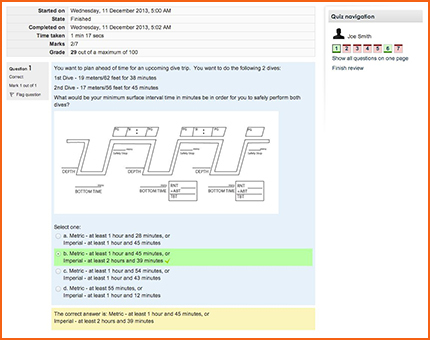 We include RDP quizzes that cover calculating Surface Intervals, Maximum Allowable Bottom Times and other RDP specific quizzes. All of our practice final exams have 50 questions, just like what you would see on your actual final. All exams have multiple choice and true/false style questions. Each time you take an exam, you will get a new series of questions. The idea is to make sure you experience the format and types of questions you will see on your final. 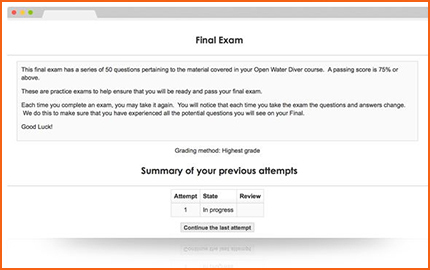 Like the actual final exam, you want to try to pass with at least a 75% grade for each practice exam you attempt. 85% to 90% is optimal. Copyright © 2015 Scuba Exams. All Rights Reserved.